But Professor Larkins is several years behind developments in renewable energy and its integration into electricity grids. In fact, we already have technically feasible scenarios to run the Australian electricity industry on 100% renewable energy — without significantly affecting supply. irregular weather patterns, which lead to uncertain and intermittent power output. This is a big challenge for electricity generators and retailers, and it can cost lots of money. But the problem of “consistency” or variability of some renewable energy sources is now better understood, both from empirical experience with lots of wind power in electricity grids, and from hourly computer simulations of electricity supply and demand performed for many states, countries and global regions. For instance, South Australia nominally has two coal-fired power stations, several gas-fired ones, and at least 15 operating wind farms. Wind now supplies an annual average of 27% of South Australia’s electricity generation. As a result, one of the coal stations is now shut down for half the year and the other for the whole year. And the state’s electricity supply system is operating reliably without the need for any additional non-renewable energy supply. In Germany, the northern states of Schleswig-Holstein and Mecklenburg-Vorpommernhave about 100% and 120%, respectively, of their electricity generated from the wind. Of course they use their transmission links with neighbouring states (including each other) to assist in balancing supply and demand with such high wind penetrations. But Australia’s National Electricity Market (NEM) has no such links to other electricity supplies. How could it increase generation from renewable energy without hurting electricity supply? Ben Elliston, Iain MacGill and I at UNSW have performed thousands of computer simulations of the hour-by-hour operation of the NEM with different mixes of 100% commercially available renewable energy technologies scaled up to meet demand reliably. We use actual hourly electricity demand and actual hourly solar and wind power data for 2010 and balance supply and demand for almost every hour, while maintaining the required reliability of supply. The relevant papers, published in peer-reviewed international journals, can be downloaded from my UNSW website. So two-thirds of annual energy can be supplied by wind and solar photovoltaic — energy sources that vary depending on the weather — while maintaining reliability of the generating system at the required level. How is this possible? It turns out that wind and solar photovoltaic are only unable to meet electricity demand a few times a year. These periods occur during peak demand on winter evenings following overcast days that also happen to have low wind speeds across the region. Since the gaps are few in number and none exceeds two hours in duration, there only needs to be a small amount of generation from the so-called flexible renewables (those that don’t depend on the vagaries of weather): hydro and biofuelled gas turbines. Concentrated solar thermal is also flexible while it has energy in its thermal storage. The gas turbines have low capital cost and, when operated infrequently and briefly, low fuel costs, so they play the role of reliability insurance with a low premium. Our research, together with similar extensive hourly computer simulations by others spanning up to a decade from Europe and the USA (reviewed in Chapter 3 of “Sustainable Energy Solutions for Climate Change”), refute Professor Larkins’ statement that “We need baseload electric power [from non-renewable sources] to guarantee security of supply”. Many regions of the world could operate a 100% renewable electricity system reliably without any baseload power stations. Indeed, in electricity supply systems with a lot of renewable energy, inflexible coal and nuclear baseload power stations get in the way. What we really need to balance the variability of wind and photovoltaic solar are the flexible renewable energy power stations: hydro, solar thermal and biofuelled gas turbines. This mix needs only a little storage from hydro and solar thermal to maintain reliable supply. With enough fuel, biofuelled gas turbines could also be considered storage. Such a mix has no need for expensive batteries or hydrogen fuel cells. Using BREE’s conservative projections for the costs of renewable energy technologies in 2030, we find that the cost of 100% renewable energy is A$7-10 billion per year more than that of the existing polluting fossil fuelled system. Although this is a 50% increase, it is likely to be less than the damage caused by the increased frequency of heatwaves, droughts and floods in a business-as-usual scenario. The renewable scenarios would be economically competitive with the fossil system either with a carbon price of A$50 per tonne of CO2 (reflecting part of the environmental and health damage from fossil fuels) or, in the absence of a carbon price, by removing the existing subsidies to the production and use of fossil fuels and transferring them temporarily to renewable energy. As an alternative to BREE’s cost estimates, Bloomberg New Energy Finance calculates that wind and solar are already cheaper than new build coal and gas in Australia. If this is correct, 100% renewable systems are already economically competitive with a new fossil-fuelled system. 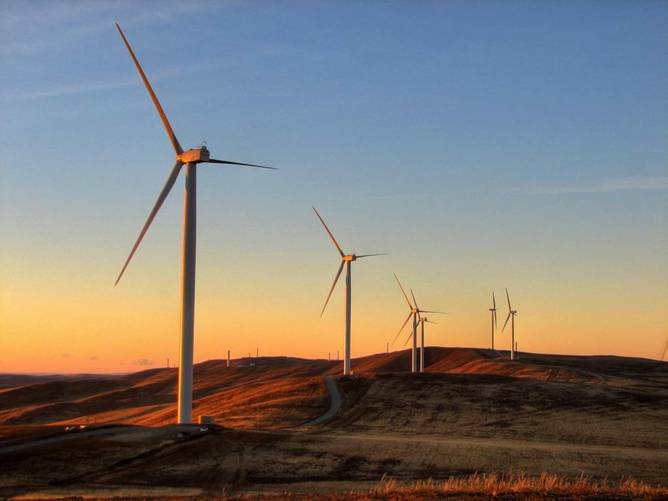 Is Australia’s Renewable Energy Target of 41,000 gigawatt hours per year in 2020 “ambitious”? Not on a world scale. 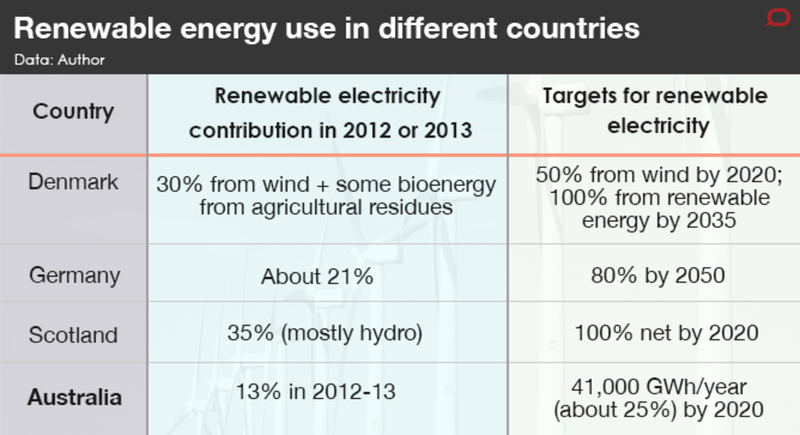 The table below compares several countries’ renewable energy contributions, as well as their official long-term targets. Considering that Australia has much greater solar energy and wind potential than the European countries, its present renewable contribution and its 2020 target are both modest. Moving to 100% renewable electricity is safe, technically feasible and affordable. It can cut greenhouse gas and other emissions and land degradation, while creating local jobs and energy security. It is ready to go! The article omits to mention that South Australia is connected to the National Grid so can be backed up Victoria’s dirty brown coal when the wind doesn’t blow or the sun doesn’t shine. The author of the above article has an over active imagination. With all of the wind farms out of action, where did he think the power was going to come from?